What’s this, a Frenchman conducting Bruckner in Germany! Whatever next? Actually, Baden-Baden and Freiburg are very close to the French border, so perhaps their populations are more open-minded than me on the subject. 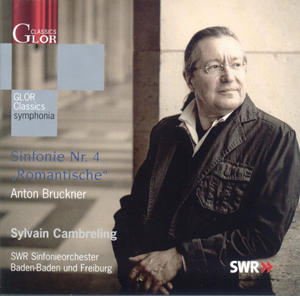 This 4th Symphony is one of three Bruckner releases from the same forces, the others being the 6th and 9th Symphonies. All are excellent recordings: appropriately architectural interpretations, excellent orchestral playing and fine sound recording. And whatever the nationality of the conductor, this is a very German reading. The brass and woodwind give a particularly German colour to the orchestra, especially at the climaxes, where the narrow bore sound of the brass in particular gives a brilliance to the tone, but without ever sounding shrill. Cambreling himself was formerly a trombone player, and perhaps this has contributed to the versatility and immediacy of tone that he is able to draw from the back of the stage. As I mentioned, he has a firm grasp of the architecture of this music, the interconnected hierarchies of the phrases, the subtle gradation of structurally crucial build ups. His one failing though, and it is a big one in the 4th Symphony, is a lack of feeling for the magic of the quieter passages. Precision, order and direction are his priorities, but sometimes in Bruckner you’ve just got to live in the moment. This is most striking in the opening, which is fast, to the point and interpreted as a short introduction to the first tutti. That’s all very well, but there is no atmosphere. Where other conductors would allow the horn soloist the space required to set the mood, Cambreling drives him (her?) on and the moment is lost. Similarly at the opening of the scherzo, where the in der Ferne horn calls fail to evoke atmosphere or distance. And in the opening of the finale, the recording almost becomes a victim of its own high fidelity. The propulsive crotchets in the cellos and basses are more evident than in any recording I have heard, and again the effect is turn a quiet, atmospheric opening into a strictly functional introduction to main business of the movement. I suspect that Cambreling values immediacy of communication over these issues, which I suppose could easily be dismissed as mere theatrics. And the immediacy is the great strength of this reading. To return to the opening of the scherzo, those horn calls are soon imitated by the trumpets and the clarinet. The accurate balance of the playing and of the recording allows each of these to come through with impressively unsentimental precision. Tempi also display a feeling for clarity and architecture. The main scherzo theme is fastish, while the trio is much slower, and changes between them are via sudden gear shifts. Thus the structure of the movement is clearly articulated. When gradual tempo changes are indicated, such as the stringendo at figure U in the scherzo (in the Eulenburg score), these are reproduced faithfully but always kept under tight control. Tight control combined with a keen sense of the dramatic is probably a good summation of this interpretation. The climaxes in the outer movements display this through a combination of unusually fast tempi and unusually loud dynamics. So when Cambreling builds up to a climax, he can energise both with fast, precise tempi, but he also knows the orchestra has something more in reserve is terms of dynamics to allow each of those peaks to really shine. But, as I say, in the quieter passages, the desire for precision and immediacy often seems at odds with the atmosphere of the music. This is a Bruckner 4 for listeners who enjoy the thrill of the climaxes and the emotional logic of the structure. It’s not one to buy if you’re only interested in the first 18 bars.